Ever wondered what animal made that peep in your backyard or that bellow in the bushes near your pond? 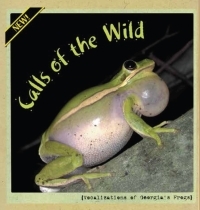 Learn more about some of these sounds with the updated "Calls of the Wild—Vocalizations of Georgia's Frogs" CD! Produced by the Wildlife Resources Division's Wildlife Conservation Section, this CD and accompanying 24-page booklet present the unique calls and life histories of 32 frog and toad species found in Georgia. The CD has separate recordings of each native species, as well as two non-native species in the state, the greenhouse frog and the Cuban treefrog. There's also more than 20 minutes of mixed-species choruses that can be listened to as natural background music or used to test your frog-identification abilities. Informative narration is provided for individual species. As part of the revised CD, an expanded booklet is packed with detail, including color photographs, natural histories, range maps and physical characteristics for each species. Single copies by mail cost $14.84, which includes taxes, shipping and handling. For wholesale orders, or credit card orders by phone, please call 770-784-3059. You can also buy the CD in the gift shop at Charlie Elliott Wildlife Center in Mansfield. Released in 2003, "Calls of the Wild" was updated and the booklet expanded in 2013. That project was funded by a grant from TERN, friends group of the Wildlife Conservation Section. Nearly all of the frog recordings on "Calls of the Wild" were made by frog expert Walter Knapp. Terry W. Johnson, former Nongame program manager and TERN executive director, narrated the CD.